Reading from Volume 6 Issue 6 of The Neuropsychotherapist. 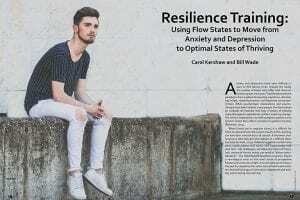 Volume 6 Issue 6 short reading course will take you though the article Resilience Training: Using Flow States to Move from Anxiety and Depression to Optimal States of Thriving byCarol Kershaw and Bill Wade. Carol Kershaw, Ed.D. is a licensed psychologist in private practice and Co-Director of the Milton H. Erickson Institute of Houston. She is an Approved Supervisor for the AAMFT, a member of the American Psychological Association, and Approved Consultant for the American Society of Clinical Hypnosis. She is also a member of the International Society for Hypnosis. She is the author of the book entitled, The Couple’s Hypnotic Dance, and has published many articles including those on the use of hypnosis with diabetes, childhood asthma, trauma resolution, and weight loss. She is an invited author for the Family Therapy Magazine. Dr. Kershaw has presented workshops and lectures at numerous Erickson Congresses, annual scientific meetings of ASCH, Evolution of Psychotherapy conferences as well as AAMFT and has been invited to present workshops in Canada, South America, and Europe. She was also invited to Saudi Arabia to lead a medical team for trauma intervention. Dr. Kershaw sings with the internationally acclaimed St. Paul’s United Methodist Church Choir and has sung with the Houston Ballet, in Westminster Abbey, and York Minster in England, Thomas Kirsche in Germany, and the National Cathedral in Washington, D.C.
Bill Wade, PhD is a psychotherapist at the Institute for Family Psychology and Co-Director of the Milton Erickson Institute of Houston in Houston, Texas. He is licensed in Texas as a marriage and family therapist and a professional counselor. Bill holds supervisory status with both licenses. He received his Master’s degree in Psychiatry and Religion at Union Theological Seminary in New York City. Bill is a Clinical member and Approved Supervisor with American Association for Marriage and Family Therapy and is a member and Approved Consultant with the American Society of Clinical Hypnosis. In addition, he is a member of the International Society of Hypnosis and The American Counseling Association. Bill has presented workshops throughout the United States on topics such as Clinical Hypnosis, Meditation, Overcoming Anxiety, and Depression, Panic Disorder, Relationship enhancement, Divorce Recovery, Parenting, and Peak Performance. He has produced numerous audio tapes on these and other topics and is the former review editor for the Milton Erickson Foundation Newsletter.